--This multimedia car audio video player has 7 inch digital multi-color TFT HD touch screen. 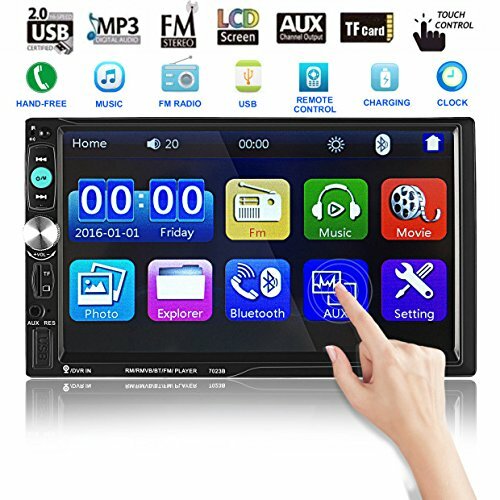 --Main function: Support playing high-definition movies/FM Radio/SD/USB/Aux Audio Input/Built-in Bluetooth + Microphone/Hands-free Calls/Rear View Camera Input(CAMERA IS NOT INCLUDED)/Wireless Remote Control. --Automatic conversion colorful lights. 24 hours digital clock, date. 【SUIT FOR ALL Of CARS】: No GPS.This ultimedia Car Audio Video Player has 7 inch HD 800 * 480 Digital Multi-color LCD Touch Screen. Support 1080P video. (Please note: This is not CD/DVD Player/GPS). MP3/MP4 Audio Video Player.Digital Clock display. This car radio MP5 player is NOT included any memory card. Suit for all of cars. 【BREAKPOINT MEMORY PLAYING】: Breakpoint Memory Playing, You can continue the last record When you watch the video or listen to music. Support Bluetooth for hands-free calling & playing music and apps.Wireless remote control.Supports steering wheel controls. Built-in USB & AUX input. .Built-in TF memory card slot. 【TRAVEL WITH LUXURY】: This multimedia car audio video player has 7 inch digital multi-color TFT HD touch screen. Support playing high-definition movies/FM Radio/SD/USB/Aux Audio Input/Built-in Bluetooth + Microphone/Hands-free Calls/Rear View Camera Input(CAMERA IS NOT INCLUDED)/Wireless Remote Control. Catuo Car Touch Screen Stereo that lets you make phone calls, stream music with Bluetooth even, and watch videos. 【BLUETOOTH CONNECTIVITY】: Built-in Bluetooth for Wireless Music Streaming - Built-in Microphone for Hands-Free Calling - Compatible with All of Your Favorite Bluetooth Devices - Digital Phone Dial Pad Display.Support rear camera input, automatically switch to rear camera when reverse the car. Perfect solution for safely backing your car. Compatible with Audio out from Smartphones and MP3 Players.